Jake Sansby strides out for Peterborough Northern Star against Harrowby. Photo: Tim Gates. Peterborough Sports will go into their big FA Vase tie next weekend (December 3) in great spirits. Sports have reached the half-way stage of their United Counties Premier Division season with an astonishing 11-point lead at the top. Top defender Matt Cox (stripes) in action for Peterborough Northern Star against Harrowby. Photo: Tim Gates. They made it 19 wins from 21 games (they lost the other two) with a routine 3-1 win over Harborough Town at PSL yesterday (November 26) thanks to two goals from Josh Moreman and another from Avelino Vieira. Sports have a tough task in the Vase next Saturday when travelling to Wembley FC. 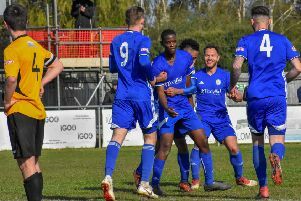 The city side’s day got even better when news from Fenland Park reached them as second-placed Eynesbury Rovers were thumped 4-1 by Wisbech Town. A three-goal burst in 15 first-half minutes from Harry Limb, Michael Frew and Luke Wilson set up the victory. Liam Adams added a fourth goal after the break before Eynesbury claimed an 87th-minute consolation goal. Josh Moreman (grinning) scored twice for Peterborough Sports against Harborough. Third-placed Deeping Rangers’ game at Rothwell Corinthians was postponed because of a waterlogged pitch, and fifth-placed Holbeach United went down 3-2 at Sileby despite goals from Aaron Eyett and Tommy Treacher. Eighth-placed Yaxley failed to close the gap on those above them as they slipped to a 3-2 home defeat to lowly Oadby. Charlie Sanders scored both Cuckoos’ goals. And Peterborough Sports are not the only happy city-based club at this level. Peterborough Northern Star chalked up a fifth win in seven matches after falling behind early on against Harrowby at Chestnut Avenue. James Hill-Seekings grabbed his third goal in two games from the penalty spot to level for Star before the break, but they had to with until the final moments for a winner when Dan Wilson kept his head to convert a one-on-one opportunity with his head. Harrowby played the final hour with 10 men after a defender was dismissed after conceding the first-half penalty. Kieran Blanchard (stripes) on the ball for Peterborough Northern Star against Harrowby. Photo: Tim Gates. In Division One Bourne made it 14 goals in two games by winning 6-1 at Woodford United as George Couzens claimed his second successive hat-trick. Max Cooper, Craig Rook and Ben Moss also scored for The Wakes who up are up to 13th. There was an also an important win for struggling Blackstones who beat next-to-bottom Burton Park Wanderers 2-0. Josh Russell, who has left Peterborough League side Ketton for Stones, scored his first goal for the first team with Steve Mastin also on target. Stamford AFC have, hopefully, started their charge up Division One South of the Northern Premier League after losing in four cup competitions recently. They claimed a dramatic 3-2 win at Gresley thanks to a last-minute goal from John King. The Daniels had earlier thrown away a two-goal half-time lead given to them by goals from Grant Ryan and Curtis Hartley. Out-of-form Spalding played well at Basford, but lost to a single goal 14 minutes from time. They remain third, 13 places and 14 points ahead of Stamford who have six matches in hand! Gresley 2, Stamford 3 (Ryan, Hartley, King).